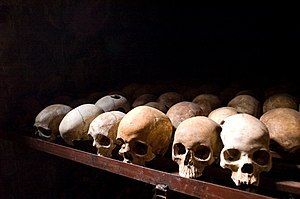 ↑ See, e.g., Rwanda: How the genocide happened, BBC, April 1, 2004, which gives an estimate of 800,000, and OAU sets inquiry into Rwanda genocide, Africa Recovery, Vol. 12 1#1 (August 1998), p. 4, which estimates the number at between 500,000 and 1,000,000. Seven out of every 10 Tutsis were killed. หน้านี้แก้ไขล่าสุดเมื่อวันที่ 8 เมษายน 2562 เวลา 05:41 น.